Meriwether Lewis has slayed monsters in the pursuit of taming the wilds of America. Now, if he ever hopes to reach the Pacific coast, he must learn an important lesson: Don't listen to the voices in your head. Collects MANIFEST DESTINY #31-36. The final issue/chapter was a definite 4-star resolution to this storyline, but it was shaky getting up to it. Half of one issue is in French (possibly Canadian French, I don’t know), which left me at a loss because for once the art did not convey the story. Turns out there’s a translation in the back, but I didn’t know that at the time, so I was frustrated that I was missing something potentially important. I suspect Dingess watched some thrillers which played with time, because he departs from The final issue/chapter was a definite 4-star resolution to this storyline, but it was shaky getting up to it. Half of one issue is in French (possibly Canadian French, I don’t know), which left me at a loss because for once the art did not convey the story. Turns out there’s a translation in the back, but I didn’t know that at the time, so I was frustrated that I was missing something potentially important. I suspect Dingess watched some thrillers which played with time, because he departs from his usual style to tell the story Tarantino-style, with flashbacks to the same moments except giving us more information in order to recontextualize the story. Unfortunately it doesn’t work quite as well in practice. There were also a couple times where I was confused by the art, which has never happened in this series before. One of Matthew Roberts’ strengths is his ability to make people who are dressed alike seem like distinct individuals, but a few times here I was lost. Once even mixing up Clark and Lewis! The idea for this collection is excellent: mutiny by the Corps using a twisted form of religion as an excuse, which sounds all too familiar in real-world 2018, combined with the brutal abuse of York the slave, again with infuriating parallels to modern America. It’s just the construction of the tale which holds it back. 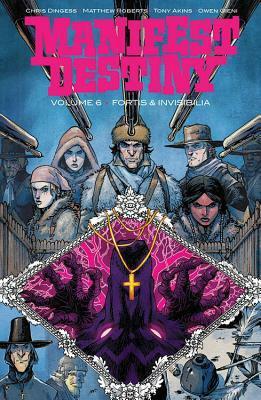 A couple of the twists were not surprises at all, which also dampened my enjoyment ((view spoiler)[Sacagawea as the killer was telegraphed; more surprising if it had been the blonde girl (hide spoiler)] ) but this is still Manifest Destiny, so the characters are perfect and the dialogue is razor sharp. I’m still in to buy the next collection on day one. This volume, I thought, was a little slow. There is a lot of drama going on, but not much supernatural action besides that ghost manipulating the team. I still love the art in this book. I should note reading this book after reading the actual journals this summer was interesting. Dare I say this book is better written? The original journals have a ton of spelling and grammatical errors that makes it hard to read at times. Tak tohle me hodne potesilo! Manifest Destiny je serie, ktera mezi ctenari proplouva tak trochu “under-the-radar” a je to celkem skoda, protoze si i pres 35+ drzi solidni kvalitu. Sice sem ji s 30. cislem prestal brat v sesitech, ale paperback sem si ujit nenechal. Kazdopadne pokracovani expedice kapitanu Lewise a Clarka na zapad Ameriky pokracuje a v tomhle pripade jsme usetreni (skoro) vsech monster a nadprirozena. Tentokrat se resi konflikt ve vlastni radach, vedlejsi postavy dostavej vic prost Tak tohle me hodne potesilo! Manifest Destiny je serie, ktera mezi ctenari proplouva tak trochu “under-the-radar” a je to celkem skoda, protoze si i pres 35+ drzi solidni kvalitu. Sice sem ji s 30. cislem prestal brat v sesitech, ale paperback sem si ujit nenechal. Kazdopadne pokracovani expedice kapitanu Lewise a Clarka na zapad Ameriky pokracuje a v tomhle pripade jsme usetreni (skoro) vsech monster a nadprirozena. Tentokrat se resi konflikt ve vlastni radach, vedlejsi postavy dostavej vic prostoru se projevit a celkove sem si to uzival a sem zvedav, co se na nas chysta dal. This review (plus volume 5) can be found on my blog: https://graphicnovelty2.com/2018/10/1... Mutiny! A few weeks after the dangerous fog, nerves are frayed and Lewis is obsessively monitoring the arch discovered nearby. Sargeant Pryor preaches to the soldiers and develops a following, creating a rift between those who align with him, and those that stay true to Lewis and Clark. Eventually Pryor plans a coup and the leaders are ejected from the fort along with others. The ghostly conquistador fro This review (plus volume 5) can be found on my blog: https://graphicnovelty2.com/2018/10/1... Mutiny! A few weeks after the dangerous fog, nerves are frayed and Lewis is obsessively monitoring the arch discovered nearby. Sargeant Pryor preaches to the soldiers and develops a following, creating a rift between those who align with him, and those that stay true to Lewis and Clark. Eventually Pryor plans a coup and the leaders are ejected from the fort along with others. The ghostly conquistador from Volume Four is moving between soldiers hoping to find the strongest leader to fulfill his diabolical plan for conquest. This volume was a bit of a convoluted mess, and I was having trouble keeping straight who was who among the soldiers. This story dragged for me, as two volumes have been set in the fort, and the dead of winter hasn’t even begun. They need to pick up the pace of the storytelling for there is still much to tell of the journey, and they are nowhere near the Pacific Northwest yet. I checked when the next issue is out, and I don’t see a date yet, so I am worried that this series will ignobly end before the journey can be properly told. Despite my rough start with this series and these shaky middle volumes, I hope the entire scope of this re-imagined journey can be properly told. I get it. The real monsters are 'the people!' but I would like some more actual monsters too again if possible. Up to now, I've really been enjoying this title. But this volume offers very little in the way of moving the story forward. It's kind of a mess, really, what with the continued resetting of events to one character saying, "I have a plan," which doesn't really show us much of anything, to a long section that is narrated only in French, without any translation (it doesn't help to have the translated pages in the back of the book, either, because the artwork really doesn't move the story along or m Up to now, I've really been enjoying this title. But this volume offers very little in the way of moving the story forward. It's kind of a mess, really, what with the continued resetting of events to one character saying, "I have a plan," which doesn't really show us much of anything, to a long section that is narrated only in French, without any translation (it doesn't help to have the translated pages in the back of the book, either, because the artwork really doesn't move the story along or make a lot of sense in and of itself). This whole story is also starting to remind me a bit too much of Dan Simmons' The Terror, especially with the mutiny that this arc revolves around. I hope the story gets back on track in the next volume and doesn't continue to deteriorate. This volume is fairly sedentary, as the expedition tries to weather the winter. But as temperatures cool, tempers rise, and a mutiny takes place, under the auspices of religion. External factors don't really come into play here, as all the protagonists and antagonists are human. But we do get some interesting focuses, as one issue is presented almost entirely in French (I appreciated the inclusion of a translation at the end of the collection), and we see exactly what humans can drive themselves This volume is fairly sedentary, as the expedition tries to weather the winter. But as temperatures cool, tempers rise, and a mutiny takes place, under the auspices of religion. External factors don't really come into play here, as all the protagonists and antagonists are human. But we do get some interesting focuses, as one issue is presented almost entirely in French (I appreciated the inclusion of a translation at the end of the collection), and we see exactly what humans can drive themselves to. There is one pivotal moment, made all the more powerful when its setup is explained (although it was somewhat predictable, the actual machinations behind it were surprising). While the characters are sedentary physically in this volume, the characters do move in their relationships with each other (York especially gets some growth and is central to another pivotal scene that shows that he may be the smartest person in the expedition, at least when it comes to dealing with the people around him). The distrust between Madame Boniface and Lewis & Clark comes to a bit of a head, and other relationships fill out in interesting ways. All told, it's not quite as exciting on its face as the last volume, but it does do a lot of work. And the art is still strong, capturing the chill of winter. Not the best volume, but still good enough to keep me invested in the series. Another good volume advancing the story. The Lewis-Clark expedition encounter new difficulties from within their ranks and have to work to survive. This plot is developed nicely and the artwork continues to be clear, detailed and well-balanced. I’d like to think that this series will not go on indefinitely and, although enjoyable, let’s see some end soon. This volume is one of the better character-driven story arcs in the series. I'm glad it took this turn mainly because Lewis and Clark finally demonstrate the cunning two men charged with their mission should have. The big twist is also a really disturbing one that plays nicely into the larger themes of moral relativism. A slower pace than the previous volume, but enough intrigue and characterization to move the plot forward and hint of events to come. Not the best volume of the series, but still pretty good. Good but not as enthralling as previous volumes.